A hidden gem! A thrill ride from beginning to end! This was the first book I have ever read from this author. I was pleasantly surprised! I really loved it! I will definitely be reading more of this author’s novels. The night I picked this book up and started reading it, I couldn’t put it down. I wound up staying up way past my bedtime and finishing half of the book. It is one of those stories you will want to read in one sitting. I flew through this book very quickly. The story starts off with an intriguing prologue that immediately has you turning the page to read more. A situation happens that lands the main character Moira in the psychiatric ward. Moira claims to hear voices, that she has two ghosts who are following her around and won’t let her be. Are they real or could she be schizophrenic? Moira’s doctor is determined to find out what is really going on, she doesn’t seem to be crazy. While in the psychiatric hospital Moira meets someone like herself. Adam. He is the only person besides Doctor Cassano she feels like she can talk to and understands her. Moira is warned that Adam is dangerous and she should stay away from him but Adam may be her only hope out of this place. Things start happening that the doctor can’t find any explanation for. A situation occurs in the hospital and Moira is afraid she is going to be blamed and never get out. Moira starts to realize there is only one way she can ever have a normal life again but the risk she has to take may mean death. This story was exciting to read. It was well written, and the characters were well fleshed out. It had supernatural elements, mystery, and a bit of romance. It keeps you on the edge of your seat. My only complaint was that the story ended. I wanted more. I wish it had been a little bit longer. I would love if this story continued into a second book! I would definitely LOVE to read more about Moira and Adam. What was the last book that kept you up reading past your bedtime? Comment below. 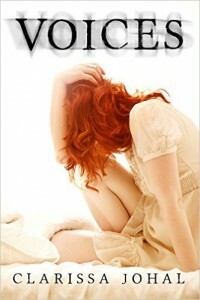 Thank you for taking the time to read/review VOICES 🙂 I’m glad you enjoyed it!